Quarter horses are one of the most popular breeds in North America. With over 4 million Quarter Horses registered, these versatile horses are found in just about all different types of competition and even used simply as pleasure horses. Quarter horse races are not as common as thoroughbred racing but are only increasing in popularity. Quarter Horses are capable of extremely fast acceleration which makes them well-suited to many different kinds of competitions. They’re especially popular in the western competitions such as reining, cutting, barrel racing, and roping. Quarter Horses may not be quite as capable of the same great speeds as their distant relatives, the Thoroughbred. They specialize in a much shorter race. Thoroughbreds have a very long stride, and are very tall and good at holding a very fast speed over longer distances. Stock Quarter Horses and Halter Quarter Horses are the most popular type of the Quarter Horse breed and maintain the breed’s characteristic small stature but massive hindquarter muscles. These horses are also used for pleasure and are kept as pets. The Quarter horses used for racing and hunting races are the horses more typically found in the horse race betting circut. Many people would mistake them for a Thoroughbred with especially large hindquarter muscles. These hunter horses are much leaner and taller, and while they do have a much longer stride than the foundation Quarter horses they still do not have the endurance of other breeds. 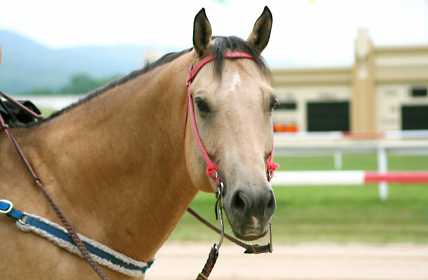 Quarter Horses are named because of their extraordinary muscles. These horse have an amazing speed and are able to outdistance even some of the most famous breeds such as Thoroughbreds in sprint races. While a Thoroughbred will win in the longer distances, the Quarter horses excel at races under ¼ of a mile. They have been recorded achieving speeds of over 55 miles an hour. Most Quarter Horse races are straight races, however the longest races which the absolute longest are 870 yards will have one turn called the “hook”. This makes Quarter Horse racing some of the shortest of all horse races, and betting these races is even more exciting. With the great speed in these short races most races will end with a photo finish. Quarter Horse racing has a great history of amazing horses and trainers. One of the most well known horses is Easy Jet. When you take into account that Quarter Horses begin racing at 2 years old while Thoroughbreds begin at 3 years old it makes Easy Jet’s tirelessness that much more amazing. He won 22 out of 26 races, and remained sound after such extensive racing and training. While Thoroughbred racing may dominate popular culture, Quarter Horse racing is growing in popularity and becoming more well known. This does not mean, however, that these races are not watched. In the horse racing community these races are prized for the thrill of such great speeds. The Thoroughbred Triple Crown is raced by 3 year old horses, however the Quarter Horse circuit has a Triple Crown run by 2 year olds. The three races that make up the Quarter Horse Triple crown are the Kansas Futurity, the Rainbow Futurity, and the All American Futurity. The All American Futurity is a favorite of betters and spectators alike, as it has an astounding $2 million dollar purse. Horse race betting on these races are extremely popular and payouts can be huge.